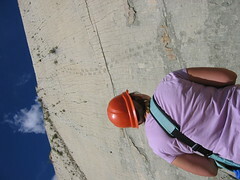 Emily looks up at a cliff with dinosaur tracks at a cement quarry outside Sucre, Bolivia. When Caitlin, Roy, Emily, and I visited Sucre back in December, Emily said there was just one thing she really wanted to do: see dinosaur tracks. Fortunately Sucre is just the place to do that. About 20 minutes outside the city there is a cement quarry where workers accidentally found a sheer cliff with dino prints in the early 1990s. The cliff wall is vertical now, but geologists speculate that was once horizontal and has tilted over time. Our guide told us that the wall had prints from four different types of dinosaurs, three herbivores and one carnivore. The cliff and prints were pretty impressive, especially from a distance. From up close, I’m pretty sure I could have made these alleged “prints” with a big hammer and 20 minutes. At the very least, I now have a greater respect for paleontologists. After looking at these footprints, I’m not sure I could have said much about them.